Boredom at work is often related to doing the same thing over and over again. This could relate to anything from our job tasks themselves, to our commute, to our working hours or our working environment. We know that variety is the spice of life, so why are so many of us still trapped in monotonous routines? Back in the 70’s, psychologists ran a study that found that 79% of British employees interviewed said they sometimes felt bored on the job; and of those people, 33% found their entire job boring. We’ve come a long way since the 1970’s – in terms of fashion as well as attitudes towards work – but these statistics show little sign of waning. More recent research has shown that 64% of UK workers report being bored. Whilst there are many different types of boredom, it is often associated with repetition and routine. In fact, in a 2017 survey of 1,200 professionals, the main reason people said they were bored, unsurprisingly, was because they do the same thing every day. Doing the same thing every day can relate to anything from our job tasks themselves, to our commute, to our working hours or our working environment. We know that variety is the spice of life, so why are so many of us still trapped in monotonous routines? In a recent poll commissioned by Mindspace, 31% of millennial employees said that they find their current workplace boring and uninspiring. Perhaps even more alarming is that 21% of millennials have actually rejected job offers because of uninspiring workplaces. This alone should tell us how important workplace design is; for retention and recruitment purposes, but also for a whole host of other reasons. Research by The Stress Management Society in 2018 found that 95% of workers cited the office environment as being important to their wellbeing and mental health. Boredom is a key piece of this wellbeing puzzle because prolonged periods of boredom have a multitude of negative physiological and psychological health impacts, from raised cortisol levels (associated with heart attack and stroke) to depression and sleep problems. Boredom has even been shown to be a contributory factor in unhealthy food choices and smoking. From a business perspective even the most mundane forms of boredom, when left unaddressed, can lead to frustration and destructive behaviour – from costly lost productivity to vandalism. In addition, bored employees are twice as likely to leave their job, according to a 2016 study by Udemy. 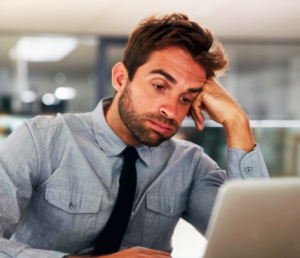 A certain level of boredom is natural and normal throughout the workday, but the decisive factor is how employees choose to deal with or respond to boredom. This is exactly why studies have found that bored employees are polarised. Some employees address their boredom in a positive way using what Management Professor Mark Skowronski calls ‘interest enhancement strategies’. These strategies might include varying your tasks, moving to a different desk, listening to music whilst continuing with a dull task; or even going for a run to refresh your mind. Others, however, deal with boredom in a destructive way – for example complaining to colleagues and eventually quitting your job. This is where well-designed workplaces with positive management practices come in, because we can try to minimise boredom, whilst empowering people to respond to boredom – when it does arise – in a positive, rather than destructive way. Even though most office spaces have now moved beyond the drab cubicle and companies are now seriously considering the impact of design as part of the drive to get the best out of employees, there is much more to be done in researching the impacts of different design elements like biophilic design, the impact of circadian lighting and the relationship between colour and productivity. But as Nikil Saval writes in his book Cubed: A secret history of the workplace one general shift is that designers and architects “are returning to behavioural studies of office workers and their needs; to design around behaviour rather than designing to influence or change it”. In theory this should result in a more engaged workforce, because we’re enabling people to do their best work by designing for what they need, not what we think they need. Agile offices – flexible spaces which incorporate different areas for different types of work – are a very popular response to the problems with the rigid, traditional format of office work. Agile working is often conflated with terms like flexible working and activity-based working, and whilst the nuances between these terms are worth bearing in mind, the central logic is the same: variation, variation, variation. Whether through hot-desking, using co-working spaces, having different workspaces to choose from in the office, or even working from home or a café, it’s just a way of keeping things fresh and keeping us motivated over time by giving us options in terms of how to work. In this way, agile working gives workers the scope to deal with boredom in a positive, productive way. Philosopher Soren Kierkegaard put this nicely back in 1843, writing that in order to live a fulfilling life and stave off boredom, we must use the principle of ‘crop rotation’. By this he means that we should constantly change what we are doing and how we are doing it in order to maximise our enjoyment and pleasure in our activities. Simply put, we shouldn’t always do the same thing because it will inevitably drain our energy and make us… well, bored. Implementing activity-based offices, remote/flexible working and hot desking policies are also a way of trusting your workers to choose their own workspaces and work rhythms – and this gives your employees a sense of ownership. This is especially important because boredom also frequently arises when people feel a lack of control over their time, activities and environment. Allowing your employees more autonomy in their work roles has proven results: higher engagement, motivation and job satisfaction. So in addition to offering a variety of workspaces, it is crucial that agile workplaces consciously empower employees to choose when, where and how they work. So, how do we get rid of workplace boredom altogether? The short answer is that we can’t. What we can do is make our environment more conducive to interest and excitement – which in business terms will lead to boosted innovation, creativity and productivity. The goal is to minimise the instances of boredom which come from inappropriate management practices or badly designed work environments, and to ensure that employees have the right tools and the right environment to deal with boredom in a productive, rather than destructive way. Katy is a researcher here at Baker Stuart, and is in her final year of a PhD at Royal Holloway, University of London. Her PhD project focuses on employee engagement and the role of boredom across a range of different workplaces and careers.